This perfect summer corn salad recipe (or corn relish salad as those in the south might call it) comes from a lovely cookbook called Cider Beans, Wild Greens, and Dandelion Jelly: Recipes from Southern Appalachia . It’s a great recipe for summer, whether it is a picnic, barbecue or every day family dinner. Cook the corn for about 9 minutes. Let cool before you remove the corn kernels. In a large bowl, combine all of the ingredients and stir gently. Cover and refrigerate for 4 hours or overnight. Stir well before serving. Fresh corn is best, but you can use canned. Colorful and nutritious, the flavors meld together perfectly. It is one of those vegetable side dish recipes that you want to make over and over again because everyone loves it. 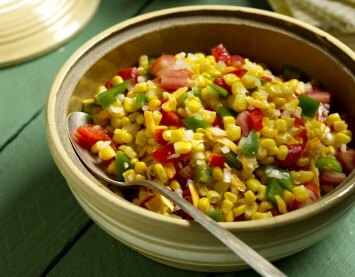 Corn salad is just one of our tasty recipes perfect for outdoor living.